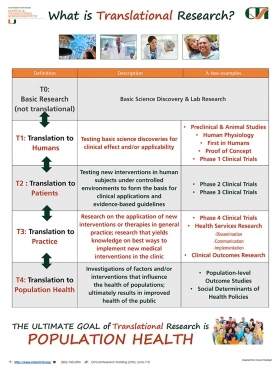 T1 Translation to Humans: Testing basic science discoveries for clinical effect and/or applicability. T2 Translation to Patients: Testing new interventions in human subjects under controlled environments to form the basis for clinical applications and evidence‐based guidelines. T3 Translation to Practice: Research on the application of new interventions or therapies in general practice; research that yields knowledge on best ways to implement new medical interventions in the clinic. T4 Translation to Population Health: Investigations of factors and/or interventions that influence the health of populations; ultimately results in improved health of the public. Clinical research is where a researcher interacts directly with a person or group of people to answer specific health questions. Clinical research helps doctors and researchers find new and better ways to understand, detect, control, and treat illness. To learn more about clinical trials and to find out how to participate in a study, visit the UHealth clinical trials page. Provide institutional support for collaborations in research. Provide support and consultation that is investigator-focused.